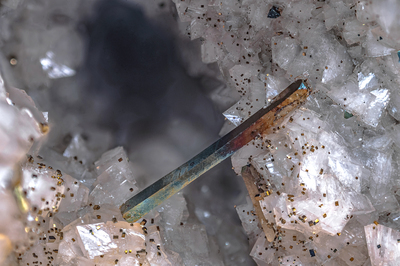 In a vug covered with pink dolomite crystals, among many small cubic crystals of pyrite, a cubic crystal, also of pyrite, two-colored, with vertices modified by faces of octahedron, elongated, so as to take on a prismatic appearance.Collection and photo of Gianfranco Ciccolini. Nikon D750, bellows, Scheider Kreuznach Componon 80 mm; f: 5.6. Focal using 7.